This creation was made for yesterday's One Layer Wednesday challenge - OLW53, which is to "Make a one-layer 'New Home' card using at least two different coloured inks." PTI's Love Lives Here collection immediately came to mind. Again, I have to laugh at how simple this card is and yet how much I struggled with it. For once, I knew exactly what I wanted to do; however, it took four tries before I got it right. It was the frame that got me. I planned to use Waltzingmouse Stamps' FRAME-IT collection to frame my little house and I love the way the sentiment fit into the open space on the frame. Every time I stamped the frame on the card, I made a mistake of some sort - ink smudges, incorrect measturement, etc. I finally got it right though, and I am happy with the way it came out. I am really loving these challenges where less is really more - I feel like I am learning a lot. Stamps ~ PTI-Love Lives Here, Waltzingmouse Stamps-Frame-It. Paper ~ Gina K. Pure Luxury White. Ink ~ Memento Tuxedo Black, So Saffron, Rose Red, Wild Wasabi. Accessories ~ Rose Red marker. Thank you always for stopping by. I appreciate your comments so much. This is super sweet, Steph! I too have a few problems when stamping the frames..they take a bit of getting used to don't they. It was worth the effort - I really like this little house - very cheerful! And I adore the sentiment! 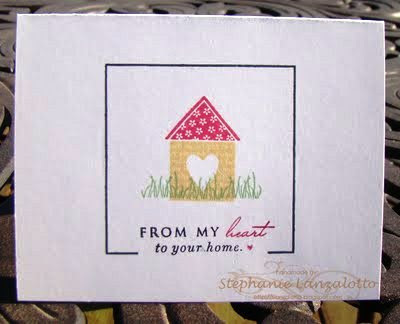 Your card is really cute, Steph! How very sweet!! The downtime with Google has left me behind! This is wonderful! Wonderful card! I definitely love your use of the frame, glad you persevered and made it work! Super cute card, Stephanie! I love that sentiment! Nice card, Stephanie. I like that little house image from PTI, and I like the colors you've used. You framed it so neatly, too! what a sweet card!! Great job with your frame....glad you stuck through with it...it looks wonderful:)!! And I'm laughing about how many tries it took (not at you, just near you). My card for this challenge took about 10 tries to get it right. Doesn't look it now, does it? Fab job on the challenge and thanks for playing along with OLW53!